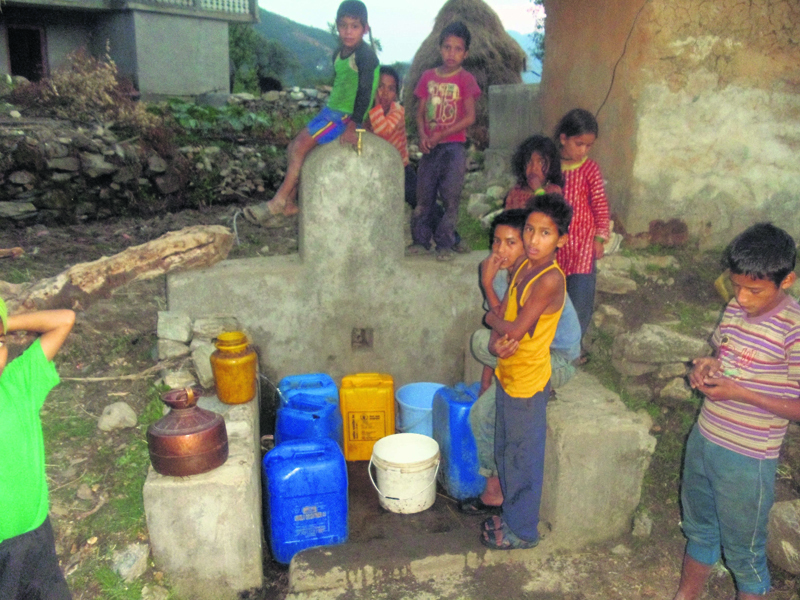 Jagat Khadka/Republica Children wait in queue for water at a community water tap in Pankot, Bajhang in this recent water. BAJHANG, March 23: Most rivers in Bajhang are not very clean because locals throw dead cattle into them, wash clothes and above all defecate on their banks. Despite knowing how much the water is impure the same locals are forced to drink water from these rivers as other water sources are drying up fast. “It’s not only us but even the Nepal Army personnel drink the same water. We know it’s impure but we have no choice other than to drink it,” said Bimala Airi, a resident of Prithvi Municipality. “Shortage of water becomes even more acute during the dry season. On the one hand temperatures soar and on the other hand there is shortage of even the river water. Let alone for cattle, we are facing water crisis for humans,” she added. There are water taps in Airi’s municipality but these dried long ago. The water taps were constructed as part of a drinking water project over a decade ago. But in the recent years the water source that fed water into this drinking water project has dried up. “Apart from the drinking water taps we had plenty of water sources around us some years back. But as water sources have dried up we have to walk two to three hours for fetching water,” Airi stated. Water crisis gradually deepens in most part of the district from March onwards. 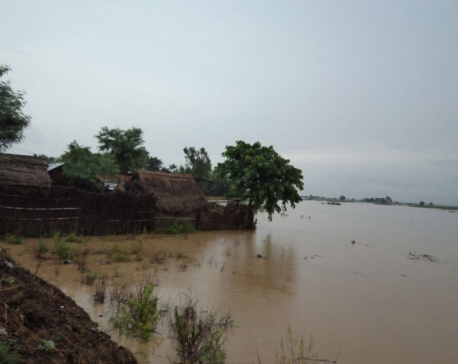 These days, locals and Nepal Army personnel of Mardan Battalion have been fetching water from several rivers including the Seti and Dugri rivers. Fetching water from the river has its own woes. The locals have to make the trip in early morning. 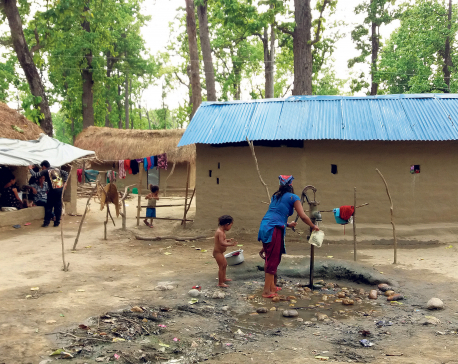 “If we do not rush to the river in early morning, we have to fetch murky water,” said Airi’s neighbor Rupa Khati. “Even though we all depend on the river for water, the river continues to be polluted by ourselves. People are not stopping defecating on the river banks and throwing wastes into it,” she added. According to Airi the biggest worry of people in Bajhang is drinking water, more so for women and children. “Culturally daughters are sent to fetch water in our society. Since the rivers are far they have been burdened by it. Sometimes, they even miss school because of these water fetching trips,” she stated. Water crisis during monsoon and dry season not only deprives them of water but also spreads several diseases. Diarrhea, dysentery and fever, among other health issues are common during monsoon and dry periods, locals say. Birendra Khadka, a resident of Hemanatwada, alleged that consumers committees and local leaders of several political parties are largely responsible for the water crisis in the district. He accused them of receiving funds for addressing the water problem but misappropriating the funds. “They get funds for resolving water crisis. But they misuse the funds and leave the crisis unresolved,” he said. “It is another matter that water sources are drying up. But the lack of planning is equally responsible for this severe lack of water,” he maintained. Apart from the drying water sources, growing population and lack of planning to cater to their water requirement is another reason behind the acute shortage, he said. For instance, in Pankot, the population has more than doubled in the last three decades. “However, they have not upgraded public service infrastructures, including drinking water supply. As far as we know, concerned authorities do get funds but what we don’t know is what they do with it,” he fumed. Prem Bahadur Singh, acting chief of Drinking Water Division Office, Bajhang, alluded to climate change for the shortage. “It is true that the government has not been able to upgrade drinking water infrastructures as per the growing population. However, the shortage is mostly because of climate change. Else, water sources would not have dried up so fast,” he said.